The Central review process lets you send Flare topics and snippets to be reviewed by subject matter experts (SMEs) or other Flare authors on MadCap Central. After making edits and adding annotations (comments) to the files in a lightweight editor on Central, the reviewers submit the finished files, sending them back to your inbox in Flare. You can then accept or reject their changes and accept the file, replacing the original source file. Cloud Review SMEs do not need to download and install any software. The review takes place in the cloud. Multi-User Editing Multiple SMEs and authors can make changes and add comments to the same topic or snippet at the same time. Review-Only Interface A lightweight version of the editor means a streamlined interface. You will only see options and features that are relevant to the review process. Auto-Save and Tracking Changes in the editor are auto-saved as you work. In addition, all changes are automatically tracked so that the original author can easily locate edits for approval or rejection. Following is how the Flare-Central review process works between the original Flare author and reviewers. 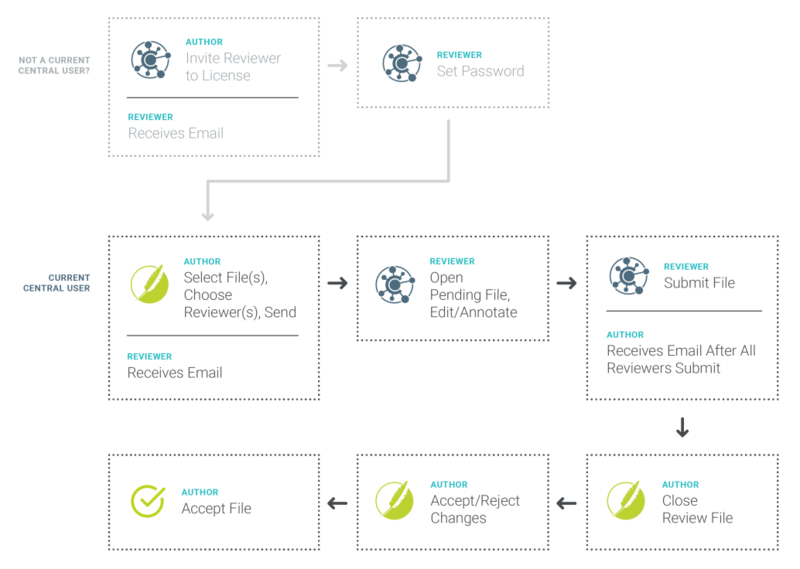 In this workflow, reviewers can be SMEs or other Flare authors. Original Author—Invite Reviewer to Central License Before you can take advantage of the review process between Flare and Central, you need to invite SMEs or Flare authors to the license (if they are not already Central users). See the Central online Help. Reviewer—Set Password When you invite people to join your Central license, they receive an email. From there, they can click a link to set a password in Central. Original Author—Select File(s), Choose Reviewer(s), and Send In Flare, the original author uses the MadCap Central window pane to log into Central. Then the author opens the Send Files for Review Wizard and populates it with topics and/or snippets that need to be reviewed by others. Also, the option Send to MadCap Central must be selected. On the next page of the wizard, the author chooses reviewers in the Central license. This might include SMEs, as well as other Flare authors. Anyone selected during this process will automatically become associated with that Flare project on Central. Also, anyone selected will become an assigned reviewer for all files chosen in the wizard. See Sending Files for Review on Central. Reviewer—Open Pending File and Edit/Annotate Anyone involved in the review process for the selected files (i.e., authors and SMEs) can open the Reviews page in Central to work with those files. After opening a topic or snippet, you can edit it or insert annotations as necessary. All changes are tracked and auto-saved as you work. In addition, other SMEs and authors can edit a file at the same time, so you will see their changes as well in real time. For details of the editor interface, see the Central online Help. Reviewer—Submit File A reviewer can return to a file in the Pending pane repeatedly over time to make changes to it. When reviewers are finished working on a file and do not need to make any further edits, they click the Submit button on the Reviews page. See the Central online Help. This moves the file to your Submitted pane. If necessary, you can view the file from there and edit it more. However, once the author closes the review process for the file, it can no longer be edited in Central. After all of the reviewers submit the file, the original author receives an email notification (if the author has enabled those notifications in Central) and the file appears in the “Inbox” view of the File Reviews window pane in Flare. 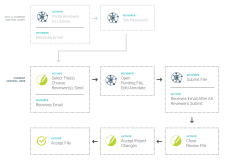 Author—Close Review File After all reviewers submit a file in Central, the author can close out the review process for that file in Flare’s File Reviews window pane. This can be done by attempting to open the file, in which case you are prompted to close out the review process. Alternatively, you can select the file (as well as several others) in the File Reviews grid and click . See Closing Central Review Files. After this, the status for the file is changed to “Closed” in the File Reviews window pane. Also, the file can no longer be edited by anyone in Central, and the file is moved to the Archive pane. Author—Accept/Reject Changes After closing the review process on Central for a file, the author can open the reviewed file in Flare. Changes can be accepted or rejected as necessary. See Accepting or Rejecting Tracked Changes (Central Reviews). Author—Accept File When authors are finished accepting or rejecting the changes, they accept the file back into the Flare project, replacing the old file. This can be done by clicking in the File Reviews window pane or in the local toolbar. See Accepting Reviewed Files. The file is then removed from the Flare inbox.